7 bedroom, 5 bathroom villa in the Emerald Island Resort community. Owned by Miss J H Witherden. Ref: 956. - 2 x HD 50" TVs complete with cable and home theater system. Emerald Island Resort is one of the most prestigious resort developments in the West US192 Disney area whilst being the closest to Disney at genuinely less than three miles. The secure manned and gated community is nestled on a large upland tropical oasis area set within hundreds of acres of nature preserve. The elevated position of the resort means that the views over the lowland wetland and woodland preserve are unrivalled. The Davenport creek runs by the resort and all the way through to Tampa bay and the wildlife is abundant with prolific rare and exotic species. Over the creek runs the land bridge which is the only approaching road into the secure resort where you will see many birds and other wildlife enjoying the natural habitat as you approach the friendly gatehouse keeper and security guard. Within the heart of the resort are 11 acres of protected woodland with nature trails and picnic areas for you and your family to enjoy a lazy afternoon away from the hustle and bustle of the theme parks. 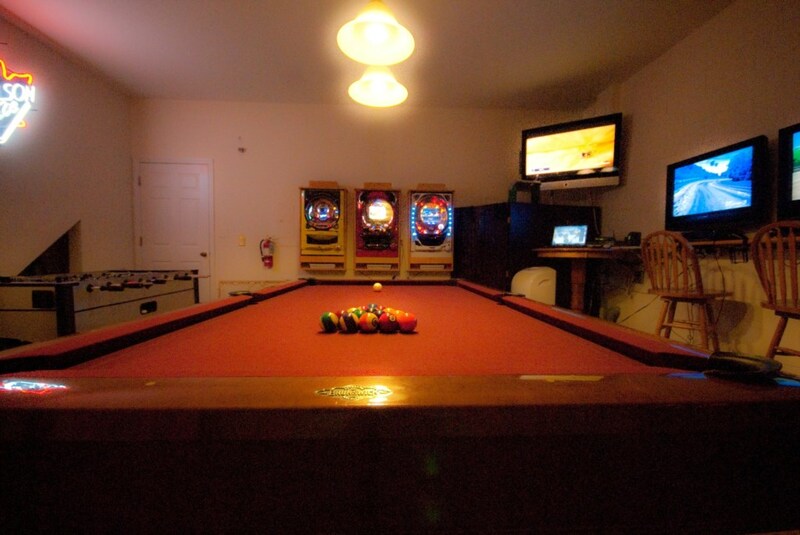 At the clubhouse you will find all the things that you would expect to find in a 5* hotel. The reception functions much the same as that of a hotel and offers information, the arrangement of transport or dinner tickets etc. The facilities include a communal pool with tiki bar for early evening drinks and snacks before dinner and a gym, sauna, cyber cafe, games arcade, sundries shop, tot lot for the younger guests and for the more adventurous, tennis and volleyball courts. *****The Emerald Villa is set on one of the most enviable and largest plots at the resort and offers more peace, quiet and tranquility than you will find almost anywhere else in the area. From the southerly facing pool deck there are beautiful views of the tranquil lake, and across from the lake there are unspoilt lush green woodland and wetland lowland habitat protected areas as far as the eye can see. No other villas spoil the view and those to the side are set back and due to the size of the plots here are far enough away allowing the pool area unrivalled privacy. The pool area was designed to be a tropical oasis to create a space worthy of the tropical views and bring some of the lush greenery closer adding to the overall seclusion of the pool deck area. The pool itself includes a large rock waterfall feature surrounded by tropical plants and flowers of the area and a selection of huge clay pots and urns full of lush green foliage. The large pool deck area was extended as far toward the lake and either side of the home as we could go to ensure that there is ample room for all our guests and more to enjoy the Florida sunshine. The southerly outlook means that it catches the full sun, but if the Florida sunshine is not your thing or you have had your fill for the day you can shade under the fans in the Lanai area and ample loungers and chairs for all are provided. Its the perfect place to break bread and drink wine as the sun falls over the horizon and the evening lighting of the pool area comes to life with a versatile atmosphere that suits either the party animals or romantics among your guests. This villa has 7 bedrooms, 6 bathrooms, a games room, two living areas and its very own private pool. 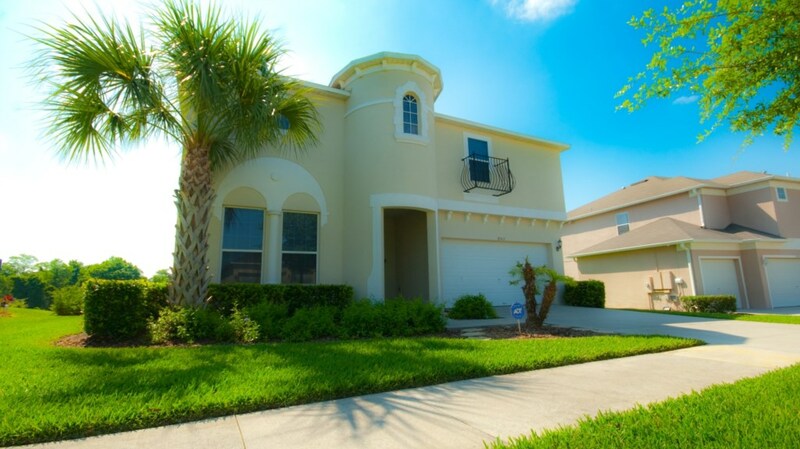 It is a Palm Harbour style designed specifically for the most prestigious "Enclave" part of Emerald Island resort. The home is conveniently located around 5 minutes walk from the clubhouse or maybe 10 if you take the nature trail. The furnishings and decor are in two forms. The dining and living room area and the main master bedrooms, with their opulent four poster beds, all have an elegant and formal style that is just plain lavish. 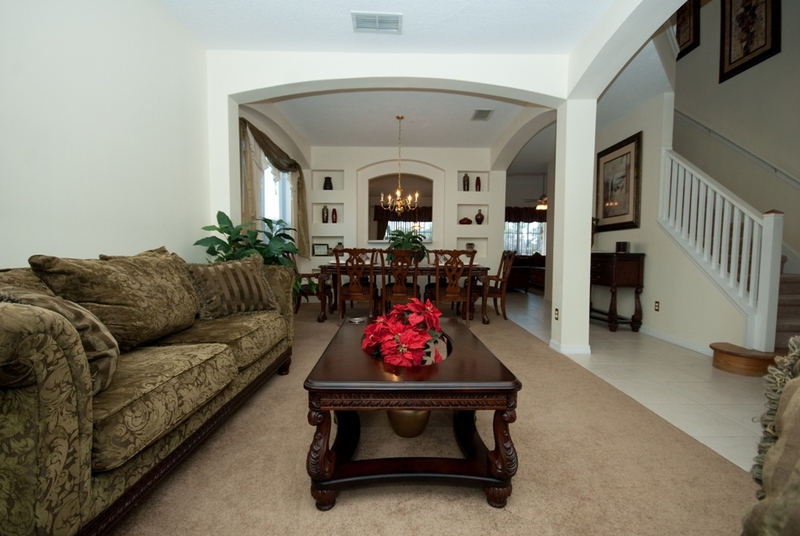 The kitchen diner and family room, however, have a much more casual style that you can really kick back and relax in. Dont get me wrong you can relax in all the rooms but these areas offer casual comfort and relaxation. 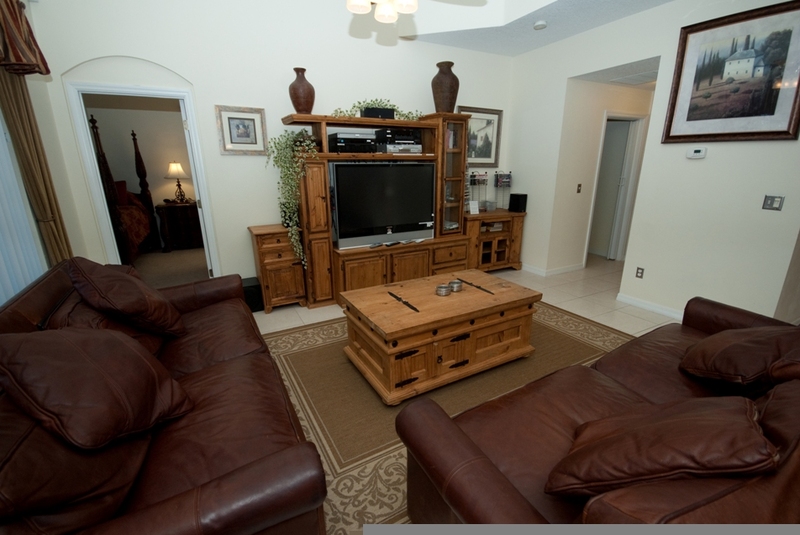 The family room boasts rustic furniture and top grain leather sofas, the ultimate in leather seating and the perfect place to enjoy the large 50" Full HD screen with digital home theater system and Satellite HD package viewing. 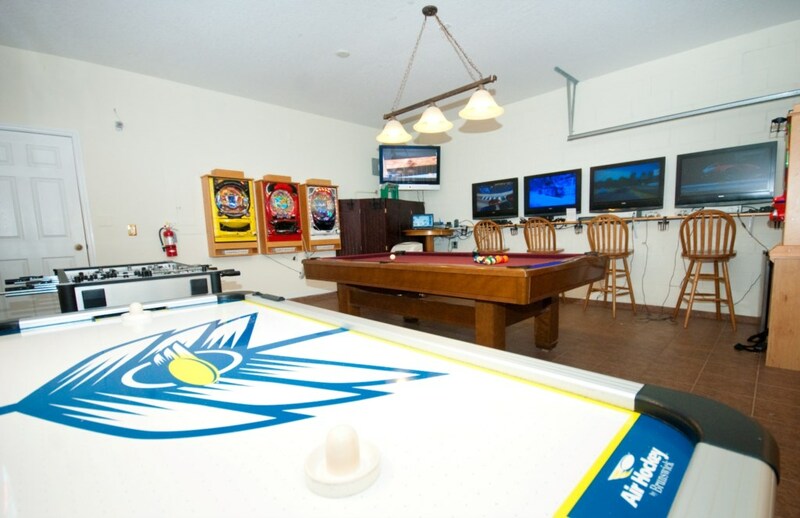 This system is amazing and a wide selection of DVDs, games has been provided for rainy days or lazy evenings. 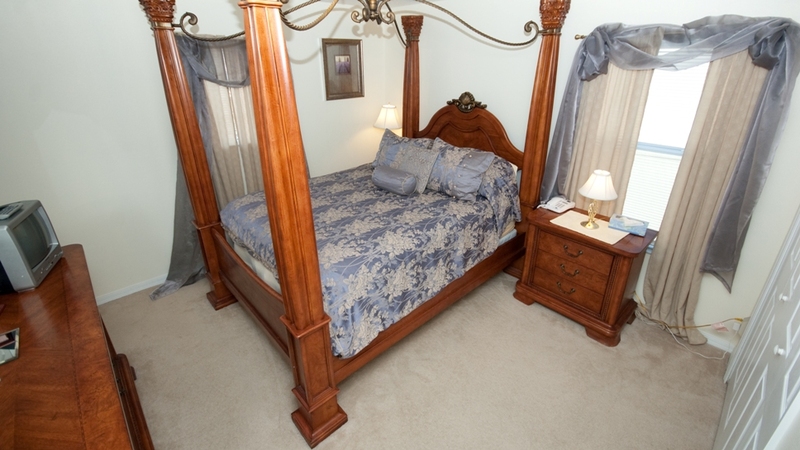 The villa has a compliment of four master bedrooms. 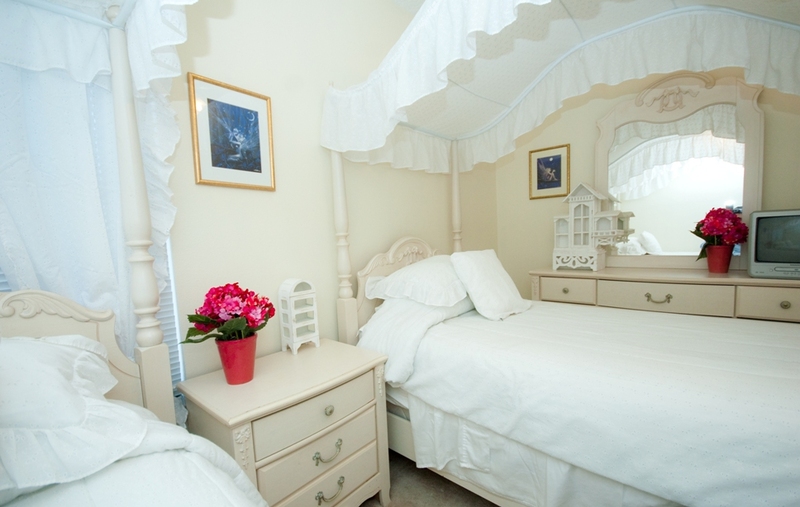 These are all ensuite and have been furnished with king or queen four poster beds with pillow top quality bedding. 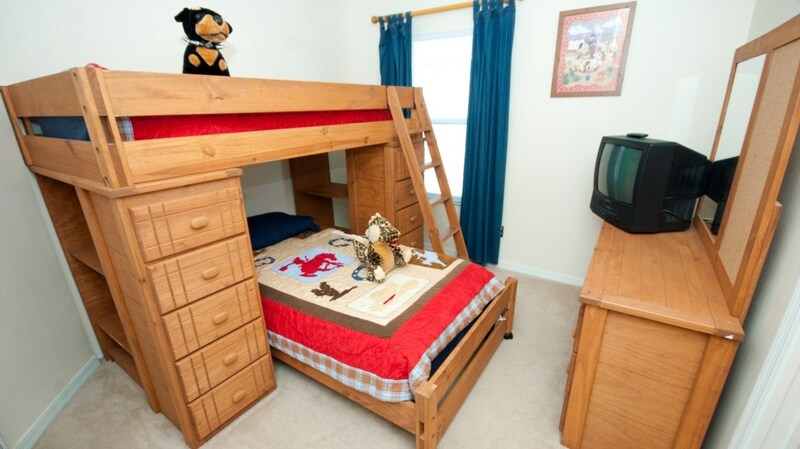 In fact all beds apart from the top bunk in the younger themed boys room are lavished with pillow top hypoallergenic bedding, so luxurious its like sleeping on a cloud and you wont want to go home. The three twin rooms each have an adjoining ensuite bathroom shared with one other room. Two of these bedrooms have been themed, the first with two single four poster beds in a white lacy fairy style for the younger more discerning ladies in the party, and the other in a Cowboy and Indian style to suit the younger gentlemen of the group. The other twin room has been furnished in a neutral style to suit anyone. 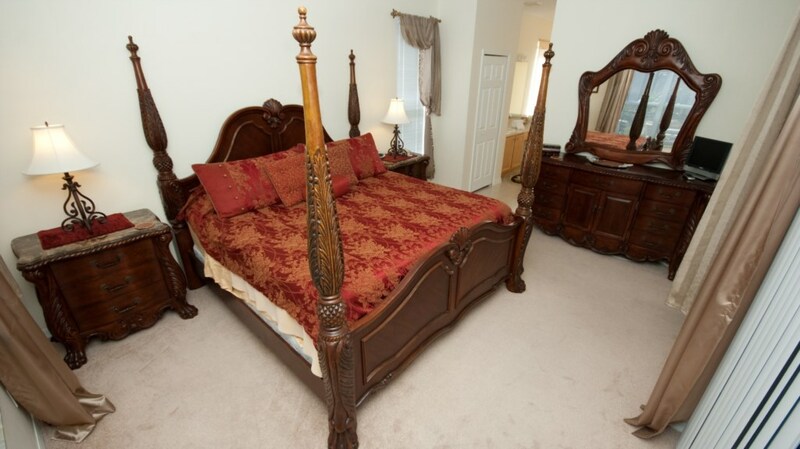 Televisions, telephones and alarm clocks etc are provided in each bedroom. The kitchen is equipped with everything that you could possibly need for providing summer drinks or snacks, to catering for full scale dinner parties. We have catered for what we consider all eventualities and guests but if you require something you feel may not be at the villa please ask and we will do our best to provide it if it isnt already there. 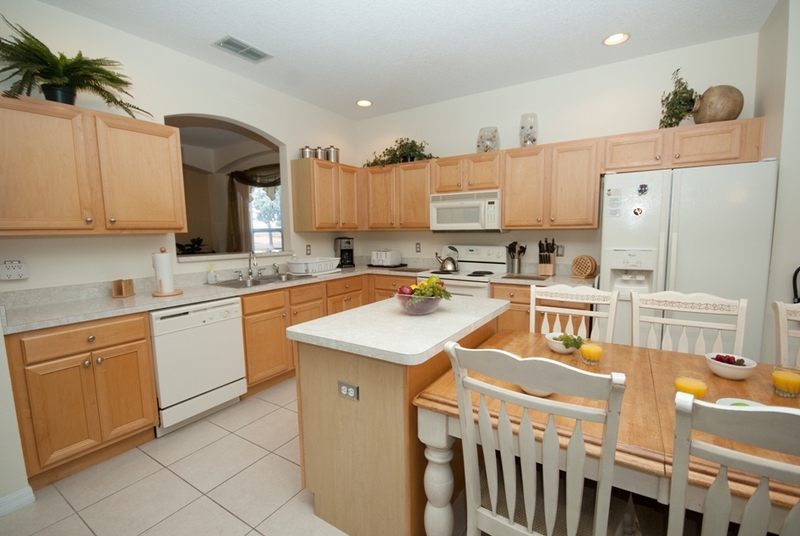 -Fully equipped kitchen with everything from a popcorn to coffee makers, juicers, you name it! It is worth mentioning that having the large selection of high quality amenities is all very well and good but it is the maintenance and cleanliness that is of the paramount importance to us. The Emerald Villa is maintained to an extremely high standard with scheduled maintenance gaps for spring cleans and carpet cleaning etc should the villa need it or not. We operate a very intensive maintenance schedule aimed at ensuring that each and every guest arrives to the same luxury, clean and hassle free vacation experience as the very first guests that vacationed there. *****The Emerald Villa....The Ultimate vacation home! “We had a WONDERFUL time. 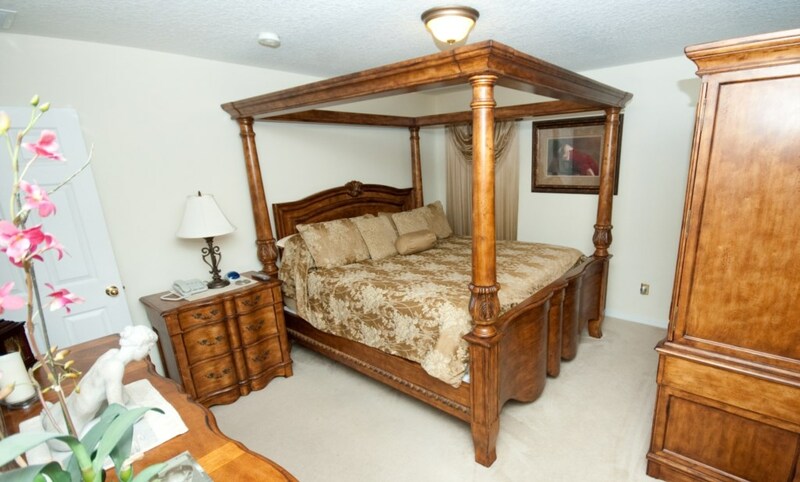 Your house had everything we could possibly want, and like you said, the beds were so incredibly comfortable. Usually you cant wait to get home and get in your own bed, but I didnt want to leave yours. It was so hard leaving on Saturday, none of us were ready to go, we wished we could have stayed another week. TELEPHONE and WiFi INTERNET – no calls have been barred on the telephones and normal use is included in the price of the villa. 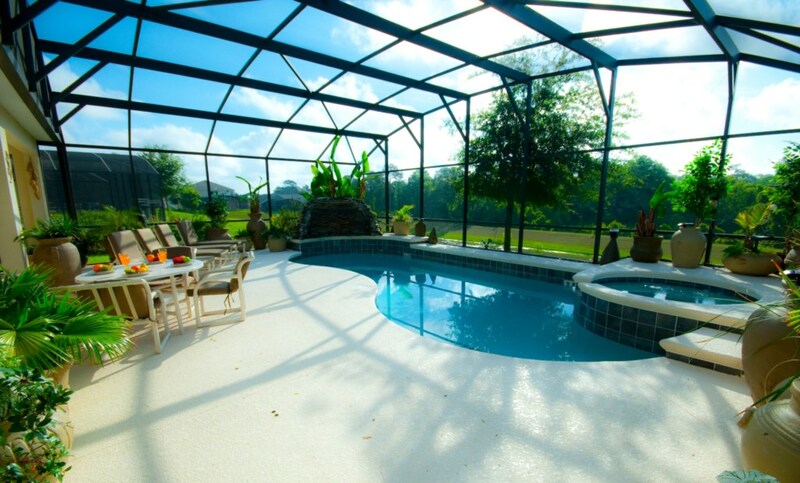 POOL and SPA HEATING – electric heating is included in the price of your vacation. GAS BARBEQUE – no extra charges for the gas or cleaning. XBOX 360s ONLINE- ready to play! VIDEO GAMES / DVDs – a wide selection of up to date media has been provided for use free of charge. Your enquiry will be sent to villa ref 956 only. This page has been viewed 25754 times since 09 Oct 2003.